I really, really, really wanted to make the original “Green Dragon Dressing” by Truth Calkins…truly I did. I watched his video about how to make it and because it had so many nutrient dense ingredients, I knew I couldn’t pass it up. It’s hard to not be amazed by his extensive knowledge on nutrients and superfoods. I heart Truth Calkins! Suggested Usage: Add on top of fish, cooked veggies, quinoa, salad, or just about anything else! The recipe contains a lot of expensive, hard-to-find specialty superfoods and while I totally agree 110% that the ingredients in the original Green Dragon Dressing Kit are some of the best superfoods known to man, the fact is, the average person can’t afford them – including me. If you are already eating raw or healthy, then you know how expensive superfoods can be. They are “super” foods, but they are also “super” expensive. Since I can’t afford to buy all the ingredients in the original recipe, I decided to make a “poor man’s” version. The foundation of the recipe was relatively inexpensive and still very nutritious and healthy even without the added expensive superfoods. I took the basic ingredients, cilantro, olive oil, tamari, onion, jalapeno, apple cider vinegar and raw honey to made a Poor Man’s version of the “Green Dragon Dressing” recipe. As Truth explains in his video, cilantro is good for detoxifying the body of heavy metals, yellow onions are high in sulfur and is a powerful antioxidant, apple cider vinegar is alkaline forming, detoxifies the joints, helps remove plaque and deposits from the cardiovascular system, cleans the kidneys, and is good for the lymphatic system. The olive oil has good omega fats and is a good antioxidant. I have never tried the original version to be able to compare the two, but the Poor Man’s version was really, really good! It’s green, creamy, a little tangy, with a hint of sweetness and a hint of the tamari and is s a perfect blend of flavors. And, it’s really quick and easy to make in a Vitamix and only takes a matter of minutes. Tip #1: Don’t worry if the dressing separates – it’s normal. I just shake mine up before serving and it’s good to go. Tip #2: I store my Green Dragon Dressing in a wide-mouth mason jar and they even make a BPA-free pourable lid that is a perfect companion to the jars for storing homemade dressings. Tip #3: You can make this a gluten-free dressing by using a gluten-free tamari. Step 1 Put all ingredients into a Vitamix blender and blend until well combined. Refrigerate and shake or stir before using as the sauce will separate. This recipe will make approximately (2) cups. The photographs for "Poor Man's Version of Green Dragon Dressing" by Karielyn Tillman of The Healthy Family and Home are licensed under a Creative Commons Attribution-NonCommercial 4.0 International License and cannot be used without my written permission. Nice work creating an affordable version of this dressing — those ingredients for the full version are definitely expensive! I actually splurged for all of them and have found that actually the recipe calls for very little of them…meaning that one purchase allows you to make the dressing over and over and over with just replenishing the onion, cilantro, jalapeno, tamari, vinegar and oils. This is one of my favorite recipes of all time, so I’m just happy to see that you’re spreading it in a simplified and more accessible form. Thanks for doing that! Hi there Matt! Thanks for your comments and I’m so glad to “meet” another fan of the famous Green Dragon Dressing! Thanks for the fantastic recipe! I really wanted to make it but wanted to keep it affordable. At my health food store I found a single serving of “green super foods” by AmaZing Grass each single serving tube was $1.05. I put in 2 and it turned out fantastic! And really simplified the process! Hi Jessica! Wow…that was an excellent idea! And Amazing Grass is an excellent product and organic too. Hi, today Im gonna make the black bean soup. Im trying to do the six weeks challenge and I really need an inspiration. So glad I found your page. I’ll try this on my salad. Since I need to eat a lot of greens. Thank you. Hi Janette! That’s great that you are doing a healthy eating challenge! You’ll find it gets much easier once you start eliminating the bad foods from your diet. Your body will actually start to crave the good nutritious foods it needs. 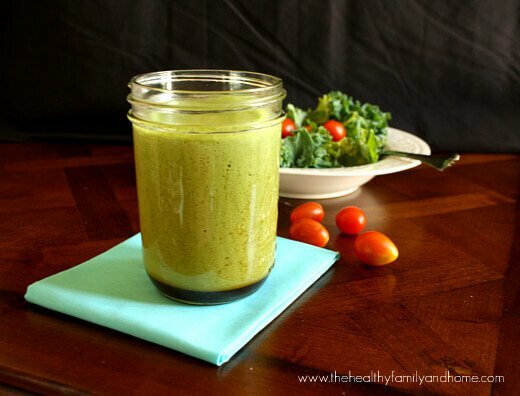 I have lots of salad dressings, dips, snacks and desserts that make it easy to stay on track…they help me a lot! I’m going to try this dressing. I hope it tastes as good as it sounds.